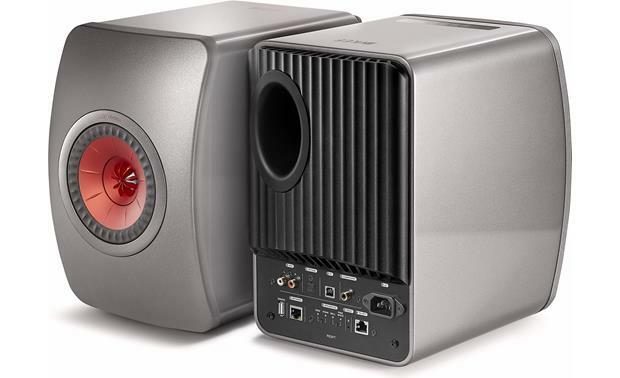 KEF LS50 Wireless powered speakers stand out from the crowd. KEF LS50 Wireless - Components and cabinet are engineered to make the LS50s sound bigger than they look. 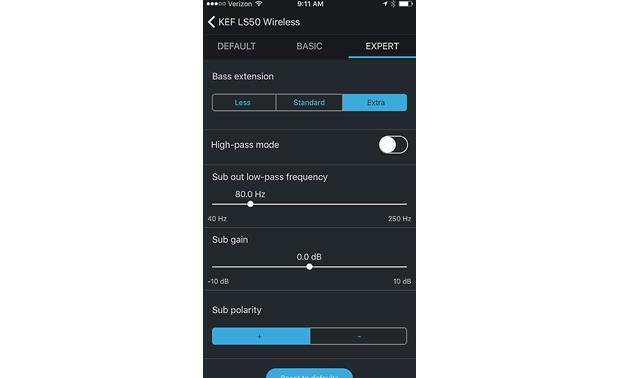 KEF LS50 Wireless - Trim and tweak settings with the free app. 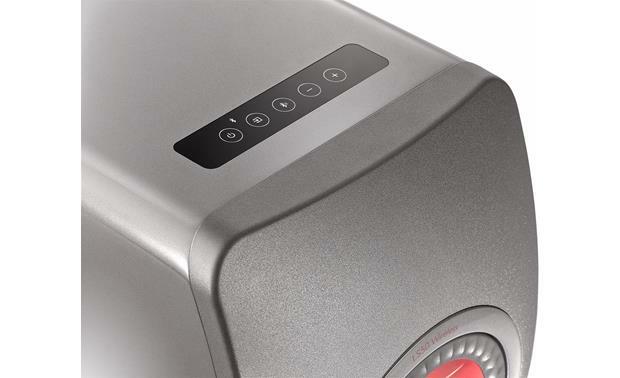 KEF LS50 Wireless - Expert speaker EQ lets you tweak the sound to your exact specifications. 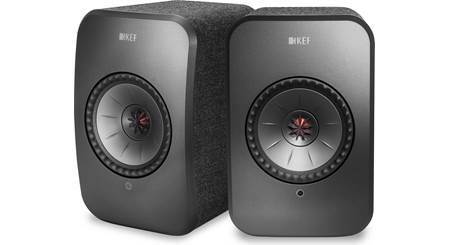 KEF LS50 Wireless - The basic room EQ function makes your LS50 speakers sound better. 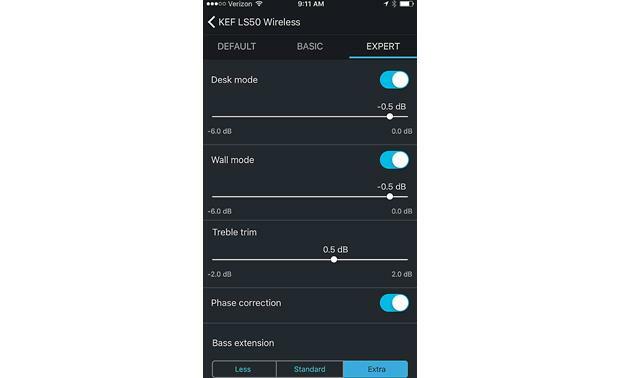 KEF LS50 Wireless - Use the app to match the speaker EQ to your room. KEF LS50 Wireless - The elliptical bass port promotes smooth air (and sound) flow. KEF LS50 Wireless - KEF put a lot of thought into every piece of the speaker assembly. 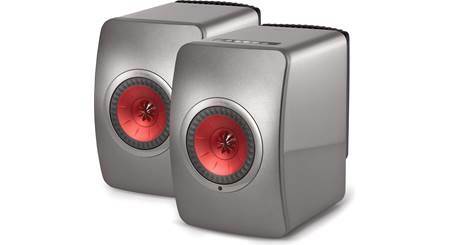 KEF LS50 Wireless powered speakers stand out from the crowd. 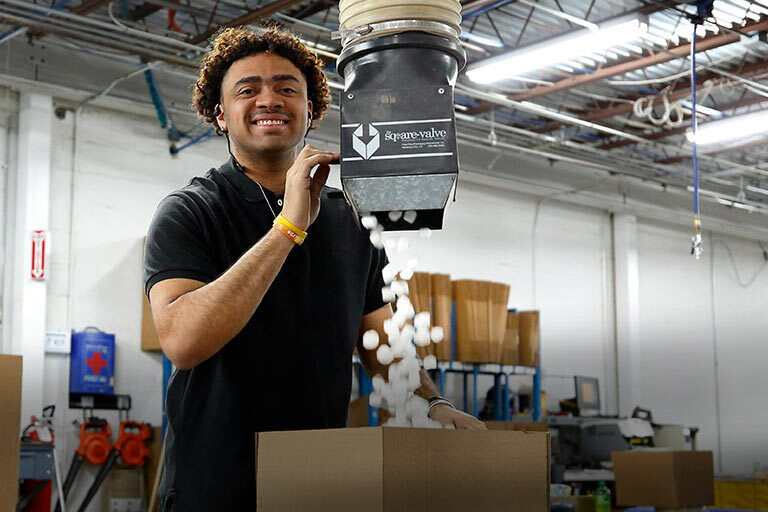 They have a lot to offer, and when we heard them at our Charlottesville HQ, they really grabbed our attention. They're beautiful, compact, easy to use, and versatile enough to form the core of your everyday sound system. And you won't believe the rich, detailed sound they produce. When you're going for that magical level of sonic realism that can raise goosebumps, one of the biggest challenges is matching the right amplifier to your speakers. So KEF has eliminated the guesswork: they put two custom-designed amplifiers in each speaker — 200 watts to each woofer, and 30 watts to each tweeter — so each driver gets perfect power. And the attention to detail doesn't stop there. Each driver has a high-end 192 kHz/24-bit DAC to make digital sound come alive. Built-in digital signal processing (DSP) offers an easy Beginner mode, but you may prefer to take total control in Expert mode, and tweak the sound to perfectly suit your unique room. Whichever way you choose, you can make your changes via a free smartphone app, available for Apple® and Android™ devices. "Something for audiophiles, something for mainstreamers – after all, it's in the LS50 Wireless' DNA. As a straddler of worlds, the KEFs walk away not only with a Knockout Award but also DAR's Product of the Year award for 2016. If this product doesn't convince audiophiles of the legitimacy of active loudspeakers, nothing will." 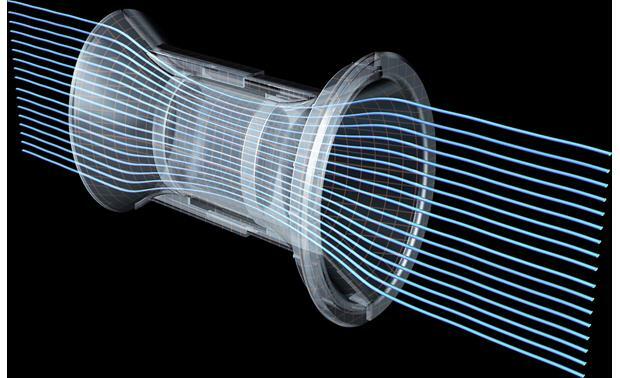 KEF's patented Uni-Q technology places each speaker's tweeter in the acoustic center of the bass/midrange cone. That lets the LS50 Wireless create a detailed, accurate, three-dimensional sound image. In essence, it makes the "sweet spot" — the ideal listening position — much larger. Sit wherever you like! It'll sound fantastic. I originally heard these speakers in our spacious training room at Crutchfield HQ, then enjoyed them later in a smaller conference room. Nothing prepared me for what they'd sound like in my own home. I fussed for a while, trying them on different stands before deciding to place them on either side of the TV, directly on the entertainment furniture. Easy-to-use Speaker EQ buttons on the back of the right-hand speaker let me quickly customize the speakers' sound to suit each location change. 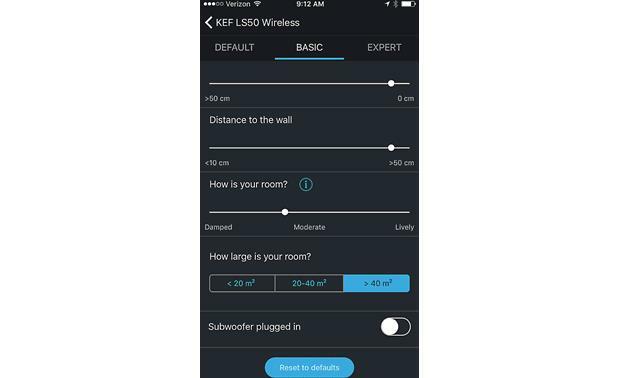 The free KEF LS50 Wireless app was there to help me further tweak the output so it sounded full and clear in my living room — an open-plan, more-or-less rectangular space with glass along one side. Once I had the basics taken care of, I started to have fun. I elected to stream some dynamic, demanding tunes via the built-in Spotify Connect, and they sounded amazing. The bass is reasonably deep and accurate when using the speakers alone, but it's a good idea to plug a subwoofer into the provided outlet to get the full experience from music and movie soundtracks. Cellos and violins sound heavenly in string quartet selections. I've revisited every one of my favorite jazz singers, just to hear the vocal nuances the LS50s can uncover. They dramatically expand the soundstage and reveal detail in every track I play. If you have limited space, but want to enjoy your music to the fullest, these speakers make a big, beautiful sound that belies their relatively small footprint. KEF knows your room is unique, so they've put the power of choice in your hands. Just download KEF's free app, and you'll be able to tune the speakers to suit your space. Once you've made all the big adjustments, you can revisit and make manual tweaks to your heart's content. KEF LS50 Wireless powered speakers offer a variety of connection points, so you can choose how you want to use them. Think of a way you want to use these LS50 Wireless speakers, and you'll likely find a connection to make it happen. Want to transform the sound from your TV? Run an optical digital cable to the back of the right-hand speaker. Enhance computer gaming by plugging your machine into the asynchronous USB port. You can even run the output of your phono preamp into the RCA inputs and enjoy your favorite records. Or, you can skip the wires altogether and stream your favorite high-res tunes through the LS50 Wireless' Bluetooth® connection. Or use your home's Wi-Fi® network to play music files from a DLNA-compatible computer or music server. The left and right speakers share audio signals via an included Ethernet cable. Did we mention that they're super-stylish? LS50 Wireless speakers come in three attractive color combinations, so they'll delight your eyes as much as they do your ears. Each has a curved front baffle that adds a touch of elegance to your shelf or speaker stands. Even the most design-conscious homeowner can find a prominent place to display these beauties. Uni-Q Driver Array technology makes your entire room sound like the "sweet spot"
Excellent speakers, highly customizable and excellent sound. Excellent support by Crutchfield, I am still testing but so far this is the winner by far. The part I have trouble picturing is the speaker interconnect ethernet cable. Mine will be on 24" stands. Will I be looking at a cable dangling between the two speakers? You could always get a longer cable and run it down one stand, across the floor, and back up the other stand. But yes, the two speakers have to be connected via an ethernet cable. Uni-Q Driver Array: The LS50 powered speakers feature KEF's patented Uni-Q driver configuration, in which the tweeter is mounted at the acoustic center of the midrange cone. With both acting as a single point source, the sound is dispersed widely and evenly throughout the listening area allowing you to experience superbly defined and perfectly balanced stereo imagery with a wide "sweet spot". The Uni-Q driver array is made up of a 1" aluminum vented-dome tweeter and a 5.25" magnesium/aluminum alloy cone woofer. 1" Aluminum Vented-Dome Tweeter: The geometry of the tweeter dome matches that of the midrange cone to avoid disrupting the waveform. By smoothening high frequency response, this helps to account for the detailed and strikingly natural-sounding treble. The 1" aluminum vented-dome tweeter utilizes a Tangerine Waveguide to encourage the sound to radiate spherically for wider, more even dispersion so that everyone in the room enjoys the same superb sound quality. A large internal vent prevents potentially distorting high pressures from building up behind the dome in the critical vocal region, preserving all the nuance and fine detail of the original performance. 5.25" Magnesium/Aluminum Alloy Woofer: The 5.25" woofer uses a magnesium/aluminum alloy cone that is light, stiff, and smooth for natural midrange and midbass sound. A well as allowing the midrange cone its full extension, KEF's ingenious Z-flex surround guides the sound from the tweeter across the surround without any disturbance or secondary radiation. Treble response is clearer and sweeter. Note: The LS50 powered speaker system does not include grilles. Bi-Amplifier Configuration: The 1" aluminum vented-dome tweeter and 5.25" magnesium/aluminum alloy woofer are powered by an incredible clean and fast 230 watt amplifier in a bi-amp dual mono configuration (200 watts to the woofer and 30 watts to the tweeter) that produces high-fidelity sound. Note: Because the LS50 Wireless speaker system is self-powered, each speaker will need to be plugged into an AC wall outlet. Advanced Time Correcting DSP: The LS50 Wireless employs an advanced time correcting DSP crossover that corrects for inherent time delays introduced in the crossover stage. FEA-Designed Cabinet: The FEA-designed cabinet with its constrained layer damping bracing and precision engineered curved baffle, along with the elliptical flexible port all work in concert to prevent cabinet vibration and resonances that produce unwanted sound coloration for clear, spacious, distortion-free sound. Curved Baffle: The curved baffle is shaped so that the sound waves spread from the drivers with minimum reflection from the edges which gives a very nice spacious sound. The curvature also improves the rigidity of the baffle which reduces vibration and sound coloration. 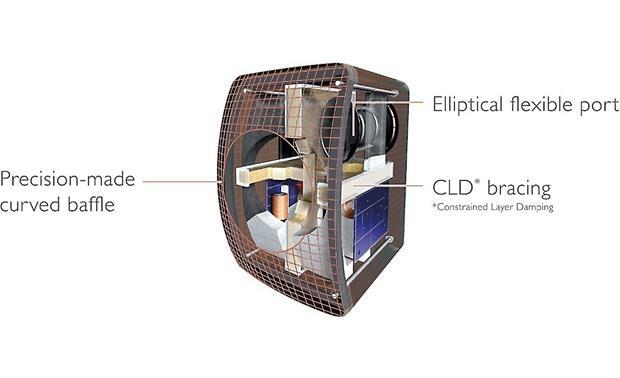 Constrained Layer Damping: The constrained layer damping which is between the brace and the enclosure walls and also the front baffle, prevents the cabinet from vibrating and radiating sound. This helps to prevent coloration in the midrange. Flexible Port Tube: The rear-firing port tube has a flexible wall which allows midrange sound that is travelling down the port tube to escape back into the cabinet and prevents longitudinal resonances; which can otherwise radiate and cause midrange coloration. The port tube also has very carefully flared walls to avoid the chuffing noises that you can hear when you get air turbulence inside the port. 24-Bit/192kHz DACs: The LS50 Wireless features an end-to-end 192kHz/24-bit high-resolution digital signal path with two separate DACs for each speaker, for a total of four for the pair. Speaker EQ: The LS50 Wireless speaker system provides a built-in Speaker EQ to tailor the sound of the system to the placement of the speaker. Select from "Desk", "Stand", "Wall", or "Free Space". Advanced Audio Settings: Through the KEF LS50 Wireless app for Apple iOS 8.0+ and Android OS 4.1+ you get access to advanced audio settings to expertly tailor the system's sound to your room environment and preference. Room Acoustics: You can select the size of your room (Small, Medium, or Large), as well as indicate the room setting (Damped, Moderate, or Lively). In addition, you can indicate how far the speakers are from the back wall. Bass & Treble: You adjust the treble trim from -2dB to +2dB. The bass extension can be set to Less, Standard, or Extra. 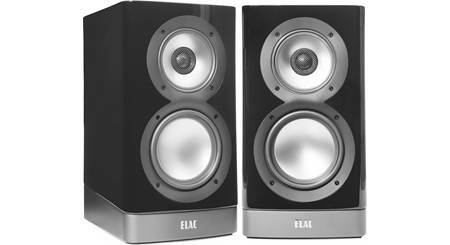 There is also phase correction between the two speakers. Sub Controls: If you connect a powered subwoofer you can activate a variable high pass (50-120Hz) & low pass (40-250Hz) crossover. You can also adjust sub polarity and sub gain (-10 to +10dB), as well as the balance between subwoofer and speaker. Tethered Cable: The speakers are labeled "RIGHT" & "LEFT". The included 10' Cat-6 cable plugs into the back of each speaker to connect them together as a stereo pair. You can set the balance between the Right & Left speaker. 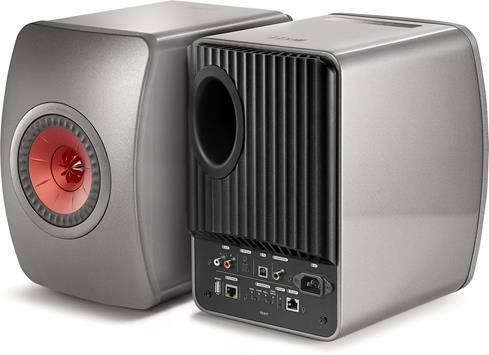 Subwoofer Output: The KEF LS50 Wireless speaker system is equipped with a mono-RCA subwoofer output to connect a powered sub (sold separately). 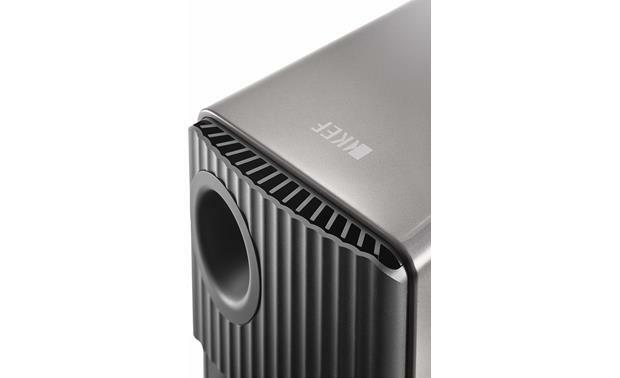 Wired or Wireless Network Connectivity: The KEF LS50 Wireless speaker system can be connected to your home network via a wired (Ethernet) or wireless (WiFi) connection. There is a RJ-45 Ethernet port (10/100Mbps) on the back of the speaker which allows for a hardwired connection. Built-in 2.4/5GHz dual-band WiFi (802.11 a/b/g/n) allows the LS50 Wireless speaker system to connect wirelessly to your home network. Online Music Services: With a wired or wireless network connection, the LS50 Wireless speaker system provides access to Tidal and Spotify using the KEF Stream app on your compatible Apple iOS or Android OS device. Tidal: TIDAL is a global streaming service that offers millions of songs in high-fidelity CD sound quality. TIDAL has two pricing tiers; either $9.99 or $19.99 a month. Both pricing levels allow you to access TIDAL's entire music library. The $19.99 tier has the added benefit of high-fidelity sound at CD-level quality. Spotify Connect: The integration of Spotify Connect will enable Spotify Premium users to instantly select and wirelessly stream music to the LS50 Wireless speaker system from within the Spotify app (Apple iOS or Android). Spotify is a digital music service that gives you on-demand access to one of the largest music libraries in the world (over 15 million tracks and counting). Spotify makes it easier than ever to discover, manage, and share music with your friends. You can browse music by artist, album, track, or most popular; and create your own music library with customized playlists. DLNA Compliant: The LS50 Wireless is a DLNA Digital Media Renderer and can play Hi-Res music files (up to 24-bit/192kHz) from other DLNA servers and NAS (Network Attached Storage) devices. The following music files can be streamed wireless via DLNA. 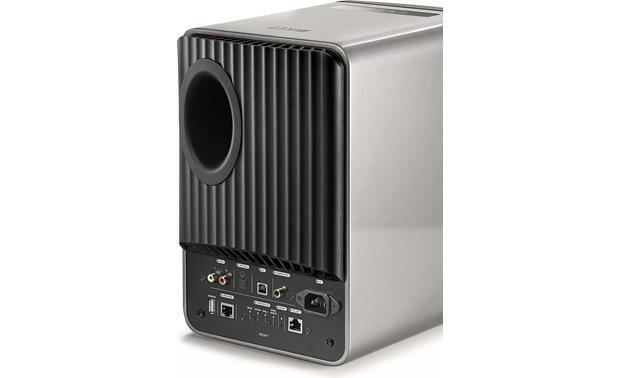 Asynchronous USB-B Port: The LS50 Wireless speaker system is outfitted with an Asynchronous USB-B port for playback of 2ch PCM music files (up to 24-bit/192kHz) from your Windows PC (7-up) or Mac computer (OSX 10.6-up). If you are using a Windows PC, you will need to download a dedicated USB audio driver from the KEF website. Note: There is also a USB-A port, but this is for service and software/firmware updates only. It cannot be used for music streaming. Optical Digital Input: The LS50 Wireless speaker features an optical (toslink) digital input with support for 2ch PCM audio (up to 24-bit/96kHz). The Optical digital input does not support Dolby Digital, DTS, or other multi-channel formats. Stereo RCA Input: The LS50 Wireless powered speaker offers an analog stereo RCA output for connection of an analog audio source device. If you want to connect a turntable, you will need a turntable with a built-in phono preamp or an external phono preamp (sold separately). Bluetooth 4.0: With its built-in Bluetooth (version 4.0), you are able to wirelessly stream stored music and music apps from your Bluetooth-enabled Apple iPod/iPhone/iPad, Android smartphone/tablet, Windows Phone/PC, Mac computer/laptop and other Bluetooth source devices to the KEF LS50 speaker. You'll still need to control music playback and view song/artist info from your Bluetooth source device. aptX: In addition to support the standard Bluetooth SBC codec, the KEF LS50 offers support for aptX. With aptX, you can stream CD-quality sound from aptX compatible devices (like Android OS 4.0+). Now your wireless music sounds rich, full, and natural with less compression. SSP: With SSP (Simple Secure Pairing), Bluetooth source devices can be paired with a single press of a button and without entering PIN code. Up to 8 devices can be paired with the LS50 speakers and two devices can remain connected, but only one device can be playing at a time. Note: Due to the differences in Bluetooth technology, some Bluetooth enabled devices may be incompatible, function improperly, or may not support all features when used with the KEF LS50. KEF Stream App: The KEF Stream App (for Apple iOS 8.0+ and Android OS 4.1+) provides full control of the LS50 Wireless speaker system using your compatible smartphone or tablet. It provides initial setup for connection to your WiFi network, as well as notifications of firmware updates as they become available. You'll also get access to select online music services such as Spotify & Tidal, as well as access to local music libraries stored on a Windows PC or other DLNA media service. You can even stream music stored locally on your Apple iOS or Android device to the LS50 Wireless speaker system from the app. In addition, you get playback controls and song/artist info with album art on the KEF Stream app. 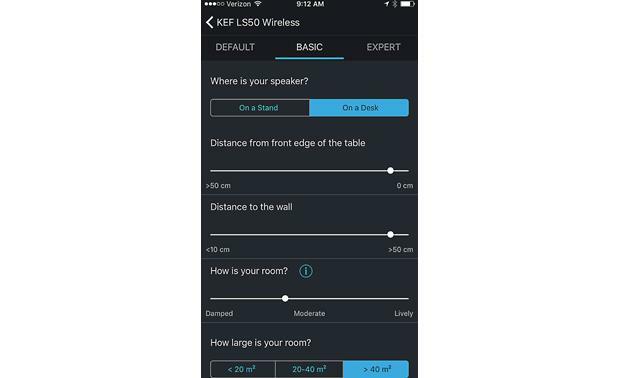 KEF Control App: The KEF Control App (for Apple iOS 9.0+ and Android OS 4.1+) provides comprehensive remote control functionalities for LS50 Wireless speaker system, further enhancing the user experience. It can be used as a stand-alone app or in combination with the above KEF Stream app. In addition to source selection, playback & volume control, firmware updates; the app offers advanced audio adjustments such as Speaker Sound Profiles, Volume Customization, and Switching between Left/Right speakers. However, the KEF Control App does not provide access to Tidal or Spotify. Roon Remote (available firmware update): Thanks to an available firmware update and the Roon Remote App (for Apple iOS 11.0+ and Android OS 4.4+), the LS50 Wireless speaker system can now use the Roon music player software to identify your personal music collection and simultaneously acts as a searchable digital engine, providing in-depth information about that collection such as album descriptions and artwork, artist photos and bios, critical reviews, tour dates and lyrics. When coupled with an additional subscription to TIDAL, Roon finds links between the your personal file and the millions of tracks available from the streaming service, so that new music can be discovered from the world beyond your own personal collection. Top-Panel & Remote Control: The KEF LS50 Wireless features top-panel touch-sensitive controls for Power, Source Selection, Bluetooth Pairing, and Volume. The included IR remote provides wireless operation of the same functions, plus Play/Pause, Previous/Next Track and Mute. So I'm not an audiophile, wish I was. I've been intending to buy used B&W CDM9s or Sonos Faber 2.5s. Are these better than a decent wired tower? Short answer is yes, but it depends on what you're looking for. On their own you'll get much better clarity, balance, and probably general sound quality in a small to medium sized room, but they may struggle a bit more if you're trying to fill a larger room. That said, I use them with an SB-4000 subwoofer in a pretty large loft room and find that combination to be much superior to any tower-based speaker system I could put together for a similar price. I use the KEF LS50W in a nearfield (desktop) environment - hooked up to a computer via a usb cable. They have an excellent sound stage, adequate bass. I can't compare to other systems. I will say that these speakers grabbed me with their musicality. I can listen for long periods of time without listening fatigue. These are truly impressive, fantastic sounding speakers. ...but I ended up returning mine for a good old amp and wired speakers. I found the wired ethernet cable that connects these together troublesome and unsightly for my particular setup. I would have dealt with that nit picky wire issue had I not also experienced some spotty wireless connectivity issues. For what it's worth none of my other wireless devices in the same location had problems. Personally, at this price I was not willing to accept any interruptions in my listening time! Now very happy with my NAD/Monitor Audio 2Ch setup. Fantastic service through this whole experience, by the way, from Crutchfield. Happy listening. Very nice speakers but they work best in a small to medium room and in my opinion really need to be paired with a musical 8" o 10" subwoofer to make them shine. I tried several subs and landed on the REL T7i being the best match for me. The cable is about 8 feet, but it has standard RJ45 connectors, so you can always get a longer one if necessary. I hide mine by taping it to the back of my stands. I can't recall if the Ethernet cable is a special cable or just regular eithernet cable. But if it's regular, I would just use a longer length and hide it on the back of the stands and run it across the floor where it wouldn't be so noticeable. Nonetheless you still have to use it some how. Hello Rich, the interconnect cable does connect the two speakers. For me, I have no problem hiding the cable, as I have a piano between my speakers, which are mounted on stands. That said, I strongly advise not letting this be a show stopper, you find a better sounding set of speakers at this price point. I've read some reviews that have said they have tested $10,000 - $50,000 systems that don't sound this good.. https://photos.app.goo.gl/Pkx7kEURjbQMu63FA Hopefully, that helps. First let me say theses speakers are truly amazing. As far as the cables go - yes there are cables running between the 2 speakers. You should be able to disguise someway. I have to be honest - I'm an audiophile - love Blues and Jazz. Speakers are worth every effort to make them work for you. Try to figure out how to hide the cable. Mine are in bookshelf so not an issue. Well, there is a cable, but it is no different than a speaker wire that would be coming from an amplifier. The interconnect cable is fairly long and you may be able to get it out of sight by running it up along the legs of your speaker stands. Since the internet connect cable is Ethernet like you said I just went and bought 5 ft cable from Amazon. My speakers do stand on KEF stand but because the cable is long enough it does drop down to the floor so you don't see the cables haning in mid air. They come with an ethernet cable that connects the two speakers. I think it's 15ft long. So it depends on your placement. I bought a longer ethernet cable; and placed it thru the hollow poles in the stands down to the floor then tucked it discretely between the base-boards and the carpet along the wall/floor, then back up the other hollow speaker stand to the other speaker. If done properly your cables can be well out of sight. Or at least as minimal as a traditional amp/speaker configuration. i have a polk soundbar and generally not happy with the zippy tone (too much high-frequency sizzle) - would this be a good replacement as a TV "soundbar"? also, can you integrate a subwoofer easily? i.e., active low-pass x-over? how would you integrate the sub when there is only cable box, tv and firestick as sources? Plug the cable box and Fire stick into the TV and run an TOSLINK cable from the TV to the speakers. The LS50W has a sub out with an active crossover that can be tweaked in the app. The subwoofer connects directly to the speakers themselves and you can configure the crossover from the app. Whether it's a good replacement for a soundbar is purely subjective. Sound quality wise yes it's better but it will not provide that same surround DSP effect. I use it for my computer set up. for that it is great. It would probably be good for a TV set up too. You would connect it via optical out. I am not sure if you can easily use a sub with it however. 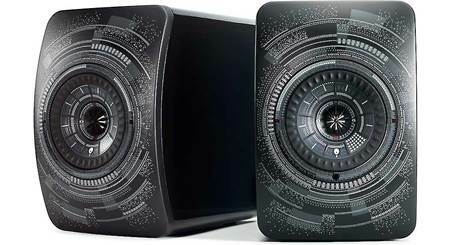 These speakers will give you a much better sounding system than a soundbar. You can simply connect a subwoofer to the the back of the right speaker (there is a connection for that) and the iPhone or Android app can set up the rest like frequency cut over etc. Only draw back for this system is that you can not power the on the speakers with a remote. You will need to physically touch the power button every time. No, but you should be able to connect an external phono stage to the unit's RCA AUX inputs. Has analog input to add phono to ls50w. I fear that these speakers may be over rated since reviewers push them so much (like the TH900 phones I bought without auditioning - very disappointed). There are people that do get really disappointed...but I really need new speakers. What do you guys think? These are not over rated. They deliver. I bought a set for myself and one for my daughter. The reviews are not overrated. The LS50 Wireless speakers are worth the price and more. They are often compared to systems costing $10K - $50K, and the reviews are correct. The speakers are NOT overrated. One way for me to describe how these KEFs sounds, is think of a pair of well amped Senn HD 800s (Original) without having to wear them. Bass is more pronounced. So definitely not thin sounding. Where is ls50 witness made? It is made in England. Where are LS50 wireless built? How well would these take the place of a sound bar system? As speakers they are wonderful: full bodied sound. First rate. They are wonderful with music wired or wireless from any source. I use them with TV and they're great. They sound like speakers that would sell for many multiples of their price. That said, they are NOT surround sound -- just good ole stereo. But they image so well, I love them. Good bass. If you want thunderous bass, you can always add a subwoofer to them. These are way better. I have them and can attest to their magnificent performance. 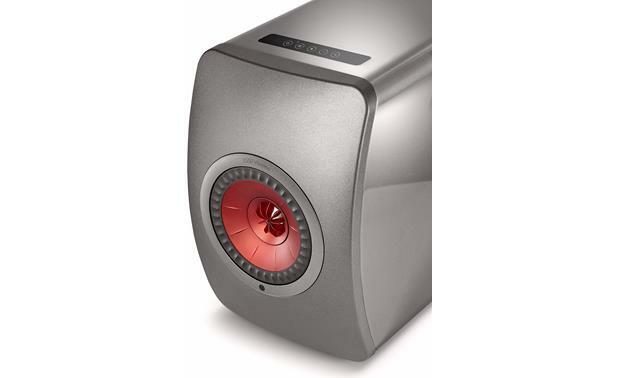 You can also check some of the high end reviews (Stereophile, Audiophile, etc. and they compare these to some of the best $10K - $50K systems that they have heard. Buy them, you won't regret it. A Ferrari replaces a Prius. Thats about all I need to say. Can I bypass the built in DAC of the LS50 Wireless with my own DAC? Sell your DAC, get these speakers. No: it does have a pair of RCA jacks for analog input, but that input is converted to digital so it can do some DSP and ship the signal to the left speaker via an Ethernet cable. Unfortunately you can't. It's really for those ho want the all in one solution. If you have a better standalone DAC, you're better off with the passive version. Yes....you need a DAC with RCA out and then input that signal to KEF's RCA input. This will bypass the KEF DAC. Yes you can, they have analog rca inputs, but know that they will be digitized again within the speaker. I have read online that some people did like/prefer the sound vs. the speaker as a stand-alone. But I will tell you the converters and electronics are so good in them, you probably won't want too. Highly recommend. No, however you would not want to. I had the Auralic Vega DAC ($3,500) and sold it together with Focal Speakers. Even if your DAC is better the sound coming out of the speakers likely would not be. There are other factors. For one the Built in DAC has a built in DSP to correct for phase shifts. An external dac does not. Secondly, the short digital wiring from the internal DAC to the speaker Amp has much less Jitter than the output wire of an additional external wiring would add. If you really want to get the best sound possible out of these things there are some critical things you could do that would improve the sound tremendously. Get the ISO accoustic 150 (newer delux version) stands. Secondly get IFI micro iUSB3.0 (and for further 10% improvemnt the Igalvanic too). Use shortest possible usb 3.0 cables. No more than 3.0 feet. Amazon Basic is really good. A great 2 head USB2.0 cable is the Pangea premium in comes in .5 meters 199. If it is a computer based system get the Dirac Live software to calibrate the system. MiniDSP sells a calibration mic for under $100 that is really good for the price. Get a good stand with decent weight. If you do get the calibration system you can change the ethernet cable the speaker is using to Audioquest Cinnamon (this will not be advisable unless you are calibrating the system since the cable with the speaker goes with the current settings characteristic of the speakers). If you sold your DAC and did all that your system would be better by another dimension. No you can't. I would consider buying the plain ls50s if you already have your own DAC. where is the damage to this speaker? front face? sound quality to be affected? "This track is unsupported and therefore could not be played" always happen When playing any tidal tracks through Android KEF APP (normal, or hifi). But tidal through Bubblepnp on ls50w is fine. Does anyone have similar issue? Any solution? Thank you. I have the same issue, though it would sometimes work for a while and then the error. My fix was to switch to Spotify, which always works. Any problem the new firmware MCU 3.0.0 and wifi 2.0.0 (July 2018)? KEF has seperated the original APP into two apps "KEF Control" and "KEF Stream" which require the new firmware. I want to update but worry about the stability of the new firmware. I just ran update and the following screen showed up: MCU New version: 3.0 Current Version: 2.5 DSP Already up to date Current Version: 0.5.4 WIFI New Version: 2.0 Current Version: 1.2 The update went fine. It took like 10 minutes. I don't see any problem after update. I actually like it. I can control these speakers from my iPhone through remote app. None so far, played with different configurations and used for 20/30 hours. Everything seems to be working fine and the app seems very functional. I did it, everything seemed to go well. Nothing really to complain about. I just wished everything was in one app, instead of two now. Hi, I just bought the LS50W. In the app, what do stand/desk, distance from wall/table actually change in audio terms (treble, mids etc)? I understand "lively room" means cutting down treble, and a large room size setting extends more bass . Also, if I want more mids, how do i adjust in app? Also, my ls50w sits on an iso acoustics aperta stands which sits on a desk. Should I set it to "stand or desk" in this case? Thanks a lot. Hi Waychai. Congrats on your new speakers and the iso acoustics stands are fantastic and a "must have" accessory. I would just go to the experience/advanced tab and turn on the stand AND desk tabs and experiment with them. On a desk, you might want them both on and start attenuating around 3db each as a start. Bass can get really boomy and tubby on a desk, especially when placed close to a rear wall. Trust your ears. ?? Try doing that AND adding a bass boost if you wish. That should help to keep your midrange clean. You'll want to take a look at the excellent videos on the KEF USA site to find the answeres to your set up and adjustment questions. Take a look at the LS50 videos of the KEF USA site I don't have an answerer to your question about the use of the Apreta stands, suggest you let your ears decide which sounds best to you. Low frequency response is altered by the desk/stand and distance from a rear wall. The LS50 Wireless compensates for the effect close boundries. Mid frequencies are not altered, but the midrange might seem more correct with proper low frequency attenuation. The high frequency compensation corrects for shortwave length effects of room acoustic no matter where the speaker is placed. 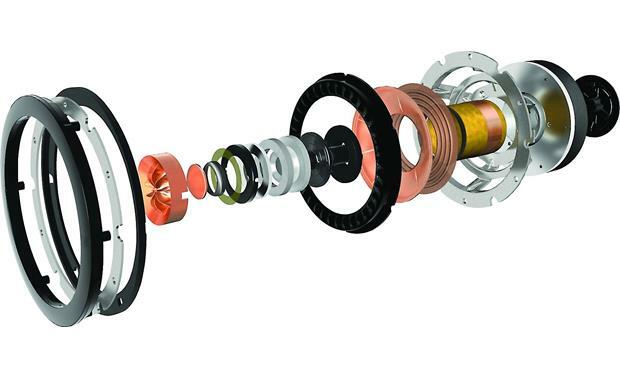 Proper high frequency compensation can also improve the midrange impression. Personally I use it for my computer system. I leave everything at default and adjust through DIRAC LIVE calibration program that I have in my Computer. External calibration will provide best results. If you do not have an external calibration you can adjust it in the software app. Use the EXPERT mode. I would start by leaving desk and Wall mode off. There you can adjust treble and Bass separately. If you feel you need more adjustment try putting desk mode on and readjusting treble and bass. Again this can help get you a better results but it will absolutely not come close to a real external calibration product. I'm not entirely sure if the settings or advanced settings have a provision to set the midrange. But I find the best way to manipulate the settings is to just experiment with all of them and see what you like. You can definately hear a difference. I interprate the speaker stands setting as deliberate and standing in free space. As long as your higher off the desk and somewhat away from the rear wall, you are in free space and I interpret that as the stands setting. But again just listen for yourself. At the end of the day in home audio, if you like the sound then just enjoy it. In someones review they mentioned loss of audio quality (sound stage...) when switching the left and right speakers via firmware switch. Has anyone else noticed this? I switched mine some time ago and feel like the sound has been a little irregular since. I can't answer your question because I am using the default setting and too lazy to try just to answer your question. However it's very hard to believe switching L/R speakers actually affect sound quality. You've already answered your own question, YES. Sorry, I'm unable to answer your question. Suggest you contact KEF directly to determine what is currently shipping. The short and sweet is to call KEF Customer support with your serial number in hand and talk to them. Auto on and off? Do they turn on with an input source and off when shut down? if i use my iPhone will they wake up and shut off or do i physically have to turn on and off? thanks!! I have to manually turn on and off. If there is a way to do sense power transition automatically I haven't found it. I only know the answer for using wifi as the input source. Yes, you will have to turn on the LS50W manually for that input source. The LS50W doesn't have the feature to wake up by wifi connection request. As for shut down, it will shut down after not using for a while. I don't know how long. No. It doesn't have auto on. But there is a time out . The longest time out is 60 minutes of no input then it will automatically turn off. Neither the IOS app nor the Android app for LS50W can wake up the speakers. Obviously, you can use the remote to turn it on. As a workaround I used a Logitech Smart Hub (with built-in IR blaster). Then I use the Logitech harmony app from my phone to turn on the LS50W. With the Smart Hub, you can also link it to Alexa/Echo then you can use voice input to turn on LS50W. Does is remember the previous input selection upon system power on? Or does it always select the first input each time you power on? Thanks. Searches related to the KEF LS50 Wireless High-performance powered speakers with Wi-Fi® and Bluetooth®.